Often coin storage is a box tucked into the back of a drawer or on a shelf in the closet. It is not really that bad of a situation; your coins are sitting undisturbed and out of the way. When you consider preserving their value for the future though, a loose grouping of coins does have room for improvement. Many economical types of coin supplies: to both house groups or single coins, are routinely used by collectors to safely hold, store and organize their coins. Your box of old coins is easily converted into a value- protection zone by placing the higher value coins into individual holders and multiple coins into quality coin tubes. Your coins are now sorted and much safer for handing and viewing. Additionally, the coin storage supplies reviewed are inert plastics; non-reactive to coins and ideal for long term protection. 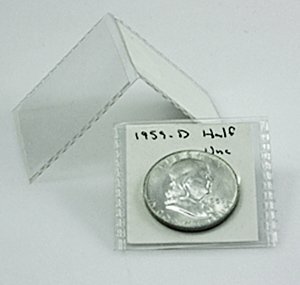 They also do a good job of avoiding discoloration by lessening a coin's exposure to air and humidity. A portion of your holdings warrant special treatment because of a coin's higher value and/or above average condition. By placing a coin in an individual holder it immediately stops further wear or damage from contact. It's very possible you recognize these; they have been in long time use by both collectors and dealers. The Cowen brand is chosen because of the heavier gage of cardboard used. Center the coin, fold and staple the sides and bottom. With the date, denomination and condition written across the top they are easy to identify and index. A popular and convenient holder; however with a drawback, the inherent risk with the staples. You can lower this risk by gently squeezing the staples with pliers to flatten. A personal favorite. Place the coin in one of the two pockets, identify the coin using the insert card in the other pocket and fold. Both Mylar; the composition of the holder and the insert card which is acid and sulfur free are excellent to safely store coins. A good choice to house the 1959 Franklin half pictured. Original vibrant luster still shines, it has been in a Saflip for over a decade. Of note: luster and the bright white of silver over time will show finger prints, I was very careful to hold this coin only by the edges when placing into the holder. An attractive display and safe coin storage combined. They are an excellent choice to house and highlight your "special" coins. Holding by the edges, place the coin into one half of the holder and snap close the other. Whitman brand holders are made of crystal clear, chemically inert polystyrene; it is especially suited for preserving delicate surfaces and luster during long-term storage. 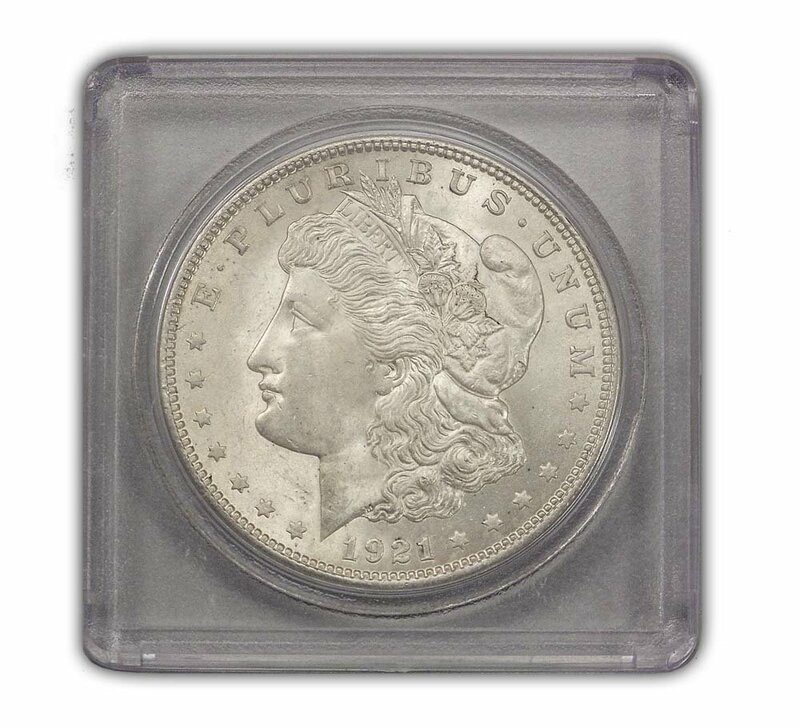 Because of its qualities it was chosen to house the 1921 Morgan dollar used to produce the logo image at the top of these pages. It made for easy handling and its clarity allowed the brilliance of the coin shine through. Three choices for single coin storage to get you started; 1) Cowen's cardboard flip, 2) Saflips and 3) Whitman's snaplock holder. Use this order of choice according to the value of the coin, condition of coin and your preference of use. The coin tube is just the right choice to keep and maintain the value of large quantities of coins. 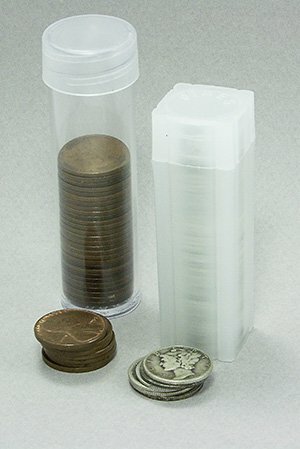 Wheat pennies by the hundreds, instead of loose or in paper bank rolls are safer in the coin tubes recommended. Handfuls of Buffalo nickels, old silver coins are all better protected in tubes, no longer sliding and abrading against each other. From experience here are two top selections. An excellent choice, clear polystyrene with a screw cap, long term protection is assured. Known for their unique square shape with a snap on cap. Inert and stable well suited to house your coins. The round tube pictured houses a collection of old circulated Wheat pennies collected back in the 1960's. As I recall it was in the 1980's they were moved from the old penny folder and placed into the tube. Admittedly the Numis brand square tube was novel and I just had to try it. An old collection of Mercury dimes also retrieved from circulation in the 1960's found a home in the square tube pictured sometime in the mid 1990's. Both the round and square tube are an economical solution to safely house quantities of coins. Once you have sorted your coins, decided which to house individually and safely placed the rest in tubes, a new-age box is available to keep everything together. Please replace your current container, most are harmful to coinage metals over time. Intercept Shield Boxes: A highly customized box for safe coin storage using only acid-free and sulfur-free materials. 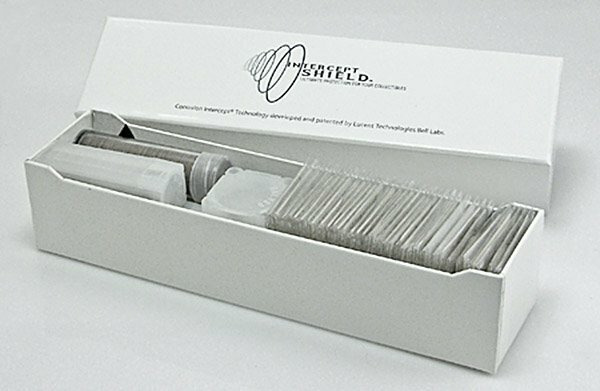 The Intercept Shield liner is what sets these apart, utilizing a neutralizing agent cleansing the air within the box, protecting your coins from corrosion. 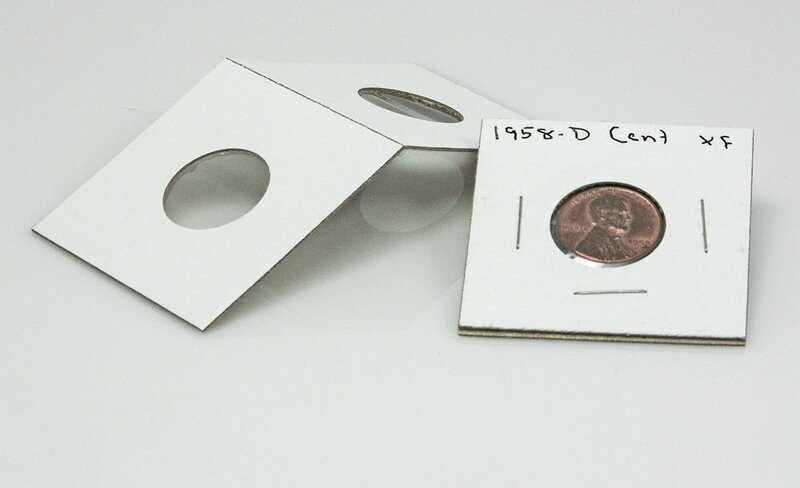 Pictured is the single row box designed to hold 2x2 single coin holders. Close to 10 inches in length there is room in this size box for single coin holders and tubes as well. Lined up are 34 single coin flips, and five different size coin tubes, cent through halves. Now in one place quite a few coins are organized and safely stored. This box is new, a necessary purchase because those on hand were marked-up with notes and not very photogenic. I shopped at WizardCoinSuppy.com to obtain the box, and while on site confirmed all recommended coin supplies above were also available. Economically smart best describes taking care of your coins, and preserving value. Safe coin storage begins with as few as just three different items; individual holders, coin tubes and a custom box. Visit the index page listing and linking to all coin values charts. 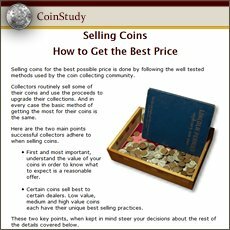 Using the method of Denomination | Date | Mintmark | Condition... determine by value those coins needing single storage and those suitable for group storage.